First Team's Six-Shooter youth training goal is the most versatile youth training goal on the market! Only Six-Shooter is capable of being configured for six different rim heights. When installed on a standard 10' high goal, Six-Shooter can be set up for 6 1/2', 7', 7 1/2', 8', 8 1/2', and 9' rim heights. Requiring only two minutes to change unit from one goal height to another, Six-Shooter accommodates programs running multiple leagues at different age levels. No tools required! Six-Shooter will fit any style rim, regardless of age or manufacturer. A Six-Shooter unit lowers rim and moves rim 24" closer to the free throw line. A regulation size rim and net are included. 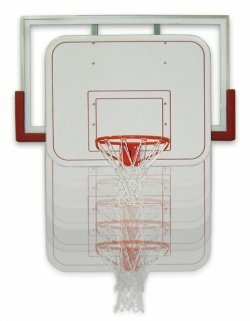 High impact white ABS plastic backboard measures 39" high and 48" wide and has red shooter\'s square and boarder machined into face. Entire system weight is 49# allowing one person standing no more that 24" above playing surface to quickly and easily attach unit to a 10' high goal. Unit is not suitable for dunking or hanging from goal. Entire Six-Shooter Youth Training Goal unit is covered by a Lifetime Limited Warranty.